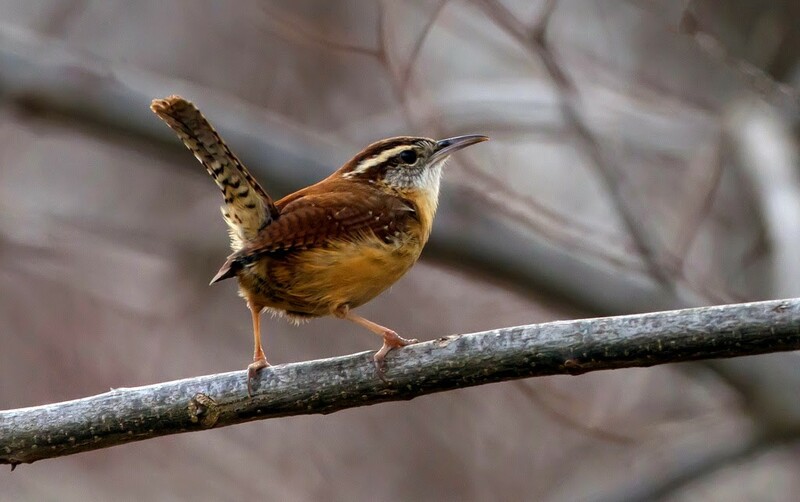 We wrap up this year’s 12 Months of Birding at the Inn series with one of our favorite little birds, the Carolina Wren, which makes Pisgah National Forest near Asheville, NC, its year-round residence. Our guests will often see the Carolina Wren venturing out from the thick evergreen bushes next to the Pool Garden. In the summer months, guests might also see Carolina Wrens hanging out in the thick brush along the pond and fluttering about in the forsythia along the split-rail fence near the driveway. They also like to forage in the woods beyond the North Terrace Room. Their diet consists of insects and fruit. Occasionally, the Carolina Wrens hop around the piles of firewood on the property, where they might have nests. We have an Eastern Phoebe who lives above the back porch door, and the Wren and the Phoebe will sometimes get in a little neighborly disagreement since the Phoebe also likes the Wren’s woods beyond the North Terrace Room, while the Wren likes to frequent the kindling and firewood near the Phoebe’s house at the back porch door. Their squabbles don’t last long; they are both good sports in the end and sort things out. We hope you’ve enjoyed our 12 birds of 2014. Stay tuned…2015 is just around the corner and our 12 Months of Birding at the Inn continues in January with one of our owl residents. We’ll tell you hoot…er…who… it will be next month.